‘Mirror, mirror on the wall, who is the hottest of us all?’ Sounds familiar? While gazing into a mirror to admire our looks and make sure every hair is in place is a common practice, peering into the glass to check our body temperature is quite novel. 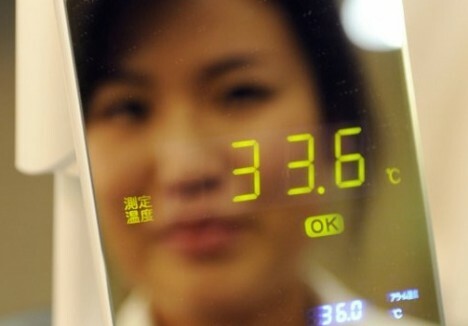 Thermo Mirror, by Japanese electronics firm, NEC/Avio, can measure a person’s temperature from a distance of up to 30cm away. It uses infra-red technology to sense the body heat without physical contact by the mirror gazer. The temperature reading is then displayed on the mirror. If the individual looking into the mirror is detected to have fever, the body temperature will be displayed and an alarm will beep to laert the individual as well as others. Priced at 98,000 yen and 120,000 yen for two different models respectively, Thermo Mirror is expected to have widespread and commercial use particularly in public areas such as schools, hospitals, offices, hotels, or airports. When not in use, the mirror displays the date,time, humidity level, and room temperature. It is hoped that SARS, H1N1 and other contagious diseases can be better contained with the help of this device.